Rome is one of those cities that has a place on nearly every traveler's bucket list. Few cities in the world mesh modern with historical in the way that Rome can and it's a destination that doesn't disappoint. 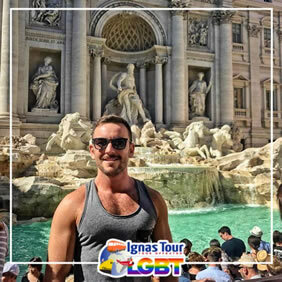 It's a major metropolitan city and with that comes a huge population of LGBT residents that live and work in the city plus countless travelers that come to behold the eternal city. 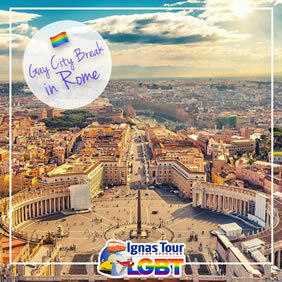 Still we have to point out that Rome is hardly a “gay” destination and the Italian capital is still highly conservative and influenced by the presence of the Catholic Church taking hold in Vatican City. Gay bars and clubs are spread out across the city. The famous “Gay Street” on Via di San Giovanni in Laterano is home to some of the most popular gay bars including, Coming Out and My Bar. At weekends and throughout the Summer season, you will find the terraces lining this street packed with local gays mixing it up with the many thousands of gay tourists who visit the city each year. • Morning walking shared tour with LGBT friendly guide. 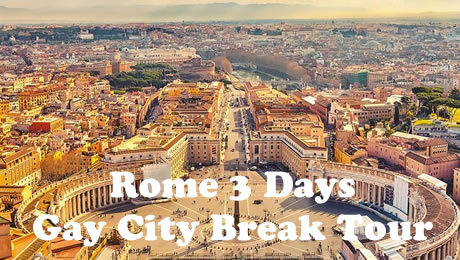 Spend a half-day seeing the essential sites of ancient Rome with a professional guide who’ll make it all come to life. • Your tour includes: Skip-the-line tickets to the Colosseum; insights into the amphitheater’s construction and bloody history; the Forum, with its temples, palaces and altar of Julius Caesar; the Via Sacra – site of ancient festivals and processions; the Palatine Hill – where Rome was founded by Romulus; the villas and gardens of emperors and the wealthy. Rainbow Tips: We can provide you Exclusive Tickets for Gay Discos with special prices ! Day 3 - Rome & Good Bye! This luxurious hotel offers a refined and courteous atmosphere, with its frescoes and marble floors. The property is just outside Villa Borghese park, and less than half a kilometer from the Spanish Steps. The Romanico Palace Hotel features a gym and spa center with sauna, relaxing area, and Turkish bath. Use of the gym is free, but the spa services cost extra. There is also a bus stop in front of the hotel, with services to the rest of the city. Piazza Barberini square is a quarter mile away. The Hotel Romanico Palace features an imperial style. Each room features elegant furnishings, marble floors, and antique furniture. The fine-marble bathrooms are complete with bathtub or shower, and some with spa bathtub. They include a satellite LCD TV, air conditioning, and a minibar. A continental buffet breakfast is served daily on the rooftop terrace with breathtaking view of Rome. Located directly opposite the Coliseum in the centre of Rome, Second Floor Hotel offers air-conditioned rooms with free Wi-Fi. The view on the Colosseum makes hotel unique in the world. Colosseo Metro Station is just 300 m away, and only 2 metro stops from termini Railway Station. Staff can arrange taxi services to both Fiumicino and Ciampino airports. Soundproofed, all rooms at the Second Floor Hotel have either a balcony or a view of the Coliseum. Each includes a safe, flat-screen TV and fridge. A sweet Italian breakfast is served at the property bar, set on the ground floor. Savoury produce can be prepared on request. 'Coming Out' Bar & Restaurant is available every day from 7.00 am to 5.00 am.